Lisa-Jo Baker is a writer, encourager of women, and cheerleader for moms at her blog, lisajobaker.com. When I heard that she was writing a memoir of her life and the way motherhood changed her, I knew it would be a delight and encouragement to read. As expected, the book did not disappoint. Lisa-Jo weaves words and writes with a beauty and honesty that will immediately draw you in. In Surprised by Motherhood, Lisa-Jo tells her story of growing up in South Africa and losing her mom at the age of 18. She knew that she never wanted to be a mom herself, but God had different plans! He worked in her heart and healed her. He gave her children who have taught her, challenged her, and helped to change her. Lisa-Jo learned that motherhood is hard, but glorious. This isn’t a “how-to” book with secrets and formulas for helping babies sleep, potty training little ones, instructing toddlers, or raising teenagers. This is the story of the making of a mother. It is Lisa-Jo’s story, and her heart is in these pages. This story is for all of the exhausted and tired moms who think they can’t do it. It is for the moms who are searching for happiness and humor in the mundane. This book is for all women who enjoy a good story of motherhood and mess and joy. I personally enjoyed reading Lisa-Jo’s story very much. Even if you are a regular reader on her blog, there is so much in this book that will be new. It is worth the read! 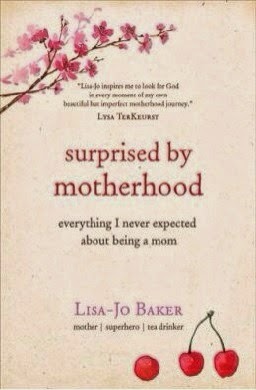 Surprised by Motherhood releases on April 1. You can pre-order your copy here. If you want a sneak peek, you can download the first three chapters for free here! Tyndale House Publishers, Inc. provided me with a complimentary review copy of Surprised by Motherhood. All opinions are my own.